and I--I took the one less travelled by and that has made all the difference. There's two ways from Corpus Christi to Austin, one on I-37 and the other along a series of speedy but charming state highways. When I was in college and Lauren and I would road trip to and from school, I'd always trick her into driving through Oklahoma, through the only section where we had to exit the interstate and travel along state highways and through small towns. At the time I thought of it only as an inconvenience. Of course now I wouldn't go any other way. The object in mind was a modern high-speed highway for the convenience of the trucking industry, with grades no greater than 8 percent. that was the immediate object. The ideal lay still further on. The engineer's dream is a model of perfect sphericity, the planet earth with all irregularities removed, highways merely painted on a surface smooth as glass. Of course, the back way isn't good merely because the interstate is bad. The back roads are delightful. There are farms and small shops and old gas station-shaped bakeries and magnificent ranches for sale and neat homes and city parks. It's also a much better use of space--there isn't a passing lane just waiting, encouraging everyone to go faster. Things take a bit longer to catch up on the back roads and so they're always charming or retro or classic. 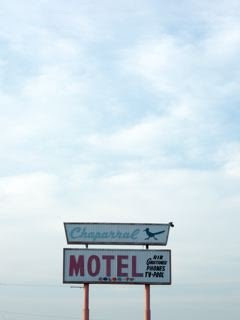 The motel sign in this picture, for example, is simple and handsome and, best of all, it isn't LED or switching between different advertisements. Even though the back way slows down through small towns, the speed limits are typically just as fast as the interstate and, because the route is often more direct, your overall trip can be even quicker than had you followed the herd. But the back way isn't just a travel tip. I believe it's a different way of doing business altogether. It's akin to buying local and taking the stairs. It's a rejection of the trend towards speed-for-its-own-sake and overdevelopment. Of course, the back way will likely soon become interstate too and the local shops will sacrifice their sidewalks for off ramps and their citizens for greeters and baristas. But until they do, we can travel a corridor in human scale, where we can change our minds, where we can slow down, and where size and speed don't necessarily determine worth.